I’ve often discussed my difficult relationship with the short story and have concluded that on the whole I much prefer a novel where the author has time to develop the characters or alternatively say something important rather than entertain me for a short while. Of course, like novels, all short stories are different some appearing in compendiums of different authors on a theme while others are chosen to reflect the different styles of a single author but of course they can consist of anything and everything else in between. In William Boyd’s The Dreams of Bethany Mellmoth the reader is treated to a loose association of stories that celebrate, or perhaps that should be denigrate the life of those who are ‘artists’, with most of the stories including the one that claims the title of this collection looking at the world of those who make their living out of the world of art. And, I enjoyed each and everyone. 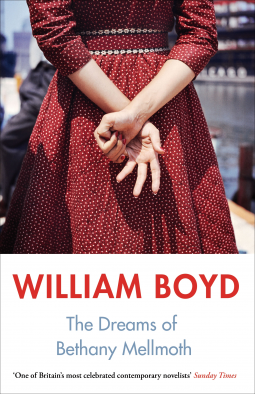 This time there was no feeling that the story despite being perfectly formed was a mere snack that stimulated rather than satiated my appetite, I can firmly say that William Boyd has given me cause to view the form with a renewed enthusiasm. My favourite story of all was the last in a the book, where Alec Dunbar, a film actor is called to an audition for a film with an embargoed script only to find out that in a case of mistaken identity the actual auditionee should have been a young female called Alexa Dunbar. Then in a twist of fate, the actor is offered a job driving a cask of holy water to a remote part of Scotland for a christening by another actress who can’t deliver it herself as she has a broken ankle. He takes the job for a price and soon finds himself in all manner of bother, planning his next move using inspiration from previous film scripts. The reader therefore gets a sense of where Alec Dunbar is in his career by the curious snippets, films about a SAS film reminded him of the car he was to drive on the mammoth journey soon morph into a short memory of some t’ai chi learnt on a Samurai movie later switching to a sentimental WWII movie. This inspired format keeps the theme of actors running through what is a farcical tale which I’m not sure I would have engaged with if I hadn’t spent my time becoming thoroughly immersed in the world of artists, their single-minded simultaneous over-confidence and crushing self-doubt that I’d enjoyed during the preceding stories. The title story is a novella and also brilliantly executed while it examines of a relatively short period of time in the life of an aspiring actress, or perhaps photographer, whereby Bethany’s dreams are adapted to the situation she finds herself in. This tale managed to elicit some sympathy and even a little admiration for her even while the sensible voice in my head is urging her to see these unrealistic dreams for what they are before her life spirals too far in a downward direction. With the book headed up by some far shorter but delightfully pithy tales there is an awful lot to enjoy in William Boyd’s collection and it has prompted me to look out some of his novels since he had dropped off my radar for some explicable reason. I’d like to thank the publishers Penguin Books UK for allowing me to read an ARC of The Dreams of Bethany Mellmoth ahead of publication on 2 November 2017, this review is my unbiased thanks to them. I like William Boyd’s writing – this sounds good. I really enjoyed it Joanne. I wanted to put this comment on your site but don’t know how to. I discovered William Boyd through his novel THE NEW CONFESSIONS which I found truly brilliant. Reading your review of The Dreams of Bethany Melmoth makes me want to read that author again. Hi Jean-Paul I got your message. I will definitely be seeking out more by this author. Great review! I love the sound of this collection and will definitely be adding it to my tbr mountain! I hope you enjoy it – there is definitely a touch of the theatrical about it! Looking forward to this one even more now! Great review. This Book is next on my list and I’m really looking forward to it. This does sound good, Cleo. And what an interesting theme to hold the stories together. I think it takes a deft hand to create a collection of stories that satisfies; the short story is not an easy form to do. I’m very glad you enjoyed this. I found it really interesting particularly as we have a stereotypical view of what ‘artistic types’ are like which feeds into some of the predicaments they find themselves in. I don’t often enjoy short story collections, but this one does look better than most. I like stories around a theme, which can draw me in and keep me reading. Thanks for sharing. I find I admire short stories more than I enjoy them if that makes sense – these were different, perhaps because there were some far longer than some examples. Oh there is nothing better than a spread sheet reshuffle – I will await your thoughts on this collection. I am a big fan of short stories because sometimes I don’t think it takes much to say a lot. I like when the collections are held together somehow – Alice Munro does this and I love “checking back in with characters” etc. I loathe short stories but love William Boyd. Maybe I’ll try these.